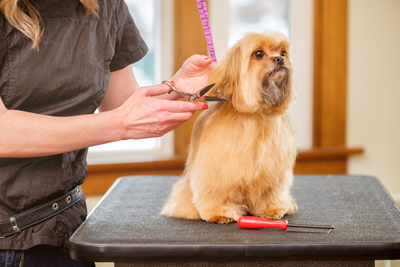 The changing seasons are a great time to make sure your dog is clean and well groomed. While every dog breed has different requirements as far as how often they need groomed, every dog benefits from getting pampered. Not to mention, dogs that are regularly cleaned and fluffed are happier and more energetic than dogs with neglected coats – something that makes all dog lovers happy. As we approach fall, make an appointment at Citydog! Club in Addison to get your cute pooch groomed and ready for whatever comes his way. At Citydog! Club, there are many grooming options for pets including a HydroSurge Bath and Moisturizing Rinse (that uses technology to penetrate the coat and bring oxygen to the skin for cleaner dogs), Heat-Free Hand Blow Out and Brush, Nail Trim and Grind, Gentle Ear Cleaning and De-Odorizing, Ear Hair Removal, Gland Express and more. “The fall is the perfect time to pamper your dog from the damaging heat and dryness of the summer and prepare them for all those holiday pictures coming up!” said Alicia Strange, general manager of Citydog! Club in Addison. Strange mentioned other options for grooming, including a skin soother with a Bath & Brush service, which helps hydrate the skin. And a Trim & Style service is a great way to get your dog ready for pictures as well. Add-ons are also available with either service option. Strange recommends the Best in Show add on, which includes their famous blueberry facial, moisturizing paw balm and teeth brushing. When Spot is happy, the entire family is happy. And after he is pampered and groomed from Citydog! Club, he will be the happiest dog on the block.